Q 1: Sir, you did not mention anything about our neighbourhood. You have a situation in Sri Lanka. The decimation of the LTTE was something which is good. But the Tamil problem does not disappear, with the defeat of the LTTE. The Tamil population has legitimate grievances. They feel they are reduced to second-class citizens. And our emphasis has been to persuade the Sri Lankan government that we must move towards a new system of institutional reforms, where the Tamil people will have a feeling that they are equal citizens of Sri Lanka, and they can lead a life of dignity and self-respect. It is not easy. Within Sri Lanka’s population, there are hotheads, the Sinhala chauvinism is a reality. But we have to find a difficult balance because what happens in Sri Lanka has a domestic dimension also. The Tamil Nadu government and assembly have often shown great worry about what is happening. Our challenge is to keep the Tamil Nadu government on our side. I have had good cooperation with Jayalalithaa-ji. I raised this matter with her the very first time. What she asked of me was moderate. Whatever be the resolutions that were passed in the assembly, I found her fully conscious of the complexities and the realities of managing this relationship. With Bangladesh, we have good relations. Bangladesh government has gone out of its way to help us in apprehending the anti-Indian insurgent groups which were operating from Bangladesh for a long time. And that is why we have been generous in dealing with Bangladesh. We are not a rich country. But we offered it a line of credit of one billion dollars, when Sheikh Hasina came here. We are also looking at ways and means of some further unilateral concessions. We are also looking at ways and means of finding a practical and pragmatic solution to the sharing of Teesta waters. I plan to go there myself. The external affairs minister is planning to go later this week. So, Bangladesh, our relations are quite good. So Bangladesh, our relations are quite good. But we must reckon that at least 25 percent of the population of Bangladesh swear by the Jamiat-ul-Islami and they are very anti-Indian, and they are in the clutches, many times, of the ISI. So, a political landscape in Bangladesh can change at any time. We do not know what these terrorist elements, who have a hold on the jamiat –e – islami elements in Bangladesh, can be upto. So a very uncertain neighbourhood. A very uncertain international, economic environment. We have to swim and keep our heads high. Q 2 –About uncertainty between the government and the party. A- Let me say that these things can be exaggerated. But it always existed in the Congress party. I welcome the expression of views, which can be helpful at times in introducing mid-term correctives. For example, let us take the case of the criticism from the party of our handling of Anna Hazare and Ramdev. When he threatened to sit on a fast, my honest attempt was that we as a government should appear receptive to all good ideas, wherever they come from. And that is why,I was the one who encouraged this dialogue with Anna Hazare, who I have known for many years. He came and spent an hour with me. And when he went back, I felt he was satisfied. But in 2-3 days I found that there are other forces controlling him, who wanted confrontation. I consciously, created a system where our government should reach out to all civil society elements. We need their inputs, and their support to carry out a social and economic transformation of the type we need in our country. I also expected that they would also play by the rules of the game. NO group, howsoever important he or she may be, can insist, that their views, A to Z, are the last word on what the people of India need. There are many other layers of NGO opinion. There is the Parliament, There are former Chief Justices of India – who have voiced differences with some of the ideas that Anna Hazare has. But it is still my endeavour, that we can, working together with the political parties, evolve a national consensus. And with regard to Swami Ramdev also, all I felt was, not to create an unnecessary misunderstanding. I wrote a letter myself, when he wrote to me. I mentioned that I share your concerns, with regard to black money and corruption, and we will be very happy if you have any ideas. And he responded quite well. When Pranab Mukherjee sent some officials, tax officials, they came back and said that Baba is very cooperative. He is not going to be a problem. Once he comes here, he will make a statement, that problems have been resolved. It was in that background, that our colleagues went to the airport, not to receive him. There also they had a good meeting. But the moment Baba is in the company of large crowds, that also has an effect on him. We did not get the impression that he has any intention of honouring what he said. He himself said, and I heard him, that 90 percent of their demands had been met. I also heard him say that when Kapil Sibal last wrote to him, and said, we will enact a law, he said all my demands have been met. But suddenly, when it came to addressing the public, he gave a different picture. Q -3: At 11 o clock a letter reached him, at 12 o clock there was a lathi charge. Are you aware of this? A- Lathi charge and teargas – these are unfortunate things – they should never have happened. But quite frankly, if we had allowed them to work during the day, the next day, we would have to handle a much larger crowd, and there worries that we had – because the way the Ramlila ground is located, there are some very communally sensitive issues. We didn’t know Sadhvi Rithambhara and others – where would that lead to. It is unfortunate that this action had to be taken. I don’t see – the situation we were placed in – there was any other alternative. Q -4 Your views on bringing PM, PMO, under the purview of the Lokpal. A- We have discussed this matter in the Cabinet last year. I for one, have no hesitation in bringing myself under the purview. But there are Cabinet colleagues of mine, who said Sir, this is not your personal concern. We are legislating for the people of India. There are many members of the Cabinet feel strongly, that bringing the institution of the Prime Minister (under Lokpal), will create an element of instability, which at times, can go out of hand. I hope that sound sense will prevail, and we would still work to find a way out. Also, the Prime Minister of India, is equally covered by the anti-corruption act. One can dismiss the Prime Minister of India most easily. All that is necessary is for Parliament to pass a vote of no-confidence. Every day, the Prime Minister is a 24-hour servant of the people of India. So we have mechanisms, much more effective mechanisms, in place. I am not saying categorically, one way or the other. I would like the guidance of political parties. Some Chief Ministers have spoken. Dr Jayalalithaa have spoken. Others have spoken. Badal sa’ab has spoken. So there is obviously a divergence of opinion in the country. We have to find a way out. I recognize we need this Lokpal bill. Even though,I don’t believe Lokpal is a panacea. Also, if we enlarge the mandate, the way Anna Hazare group wants it – they want 15,000 people, independent of the existing intelligence and prosecuting agencies. If we want to cover every single civil servant of our country – Centre and States – I worry whether the system will be able to stand the strain. Let us concentrate on corruption in high places – which is most obnoxious – which invites wrath – that is a justified concern. Wherever possible, we will act, and act firmly. Q-5 What about the judiciary? I have been talking to a number of people about this – the serving judiciary as well as a number of other people. They have grave reservations of including higher judiciary. People say, why set up a separate mechanism – we have a judicial accountability bill. We have a new set-up – the judicial selection board- which will look into all complaints against judges. But Supreme Court has to ultimately pronounce on everything. How will the Supreme Court pronounce on complex issues, if it is subject to restrictions of the Lokpal. I am not a legal expert. I think several distinguished luminaries have questioned this particular suggestion in the Jan Lokpal Bill – saying that this runs counter to the constitutional scheme of things. Judiciary must be encouraged to find ways and means to regulate its own affairs – consistent with the spirit of the constitution. That is my preliminary feeling. But as I said, I am not going to pronounce. I would like to hear from the political parties, and if necessary, we should hear other groups also – what they are thinking. Q-6 :Are you confident of getting a national consensus – on the bill in Parliament, given the opposition’s resistance to it? A – Yes I am confident. Q -7: What about the cabinet reshuffle? A – That is a work in progress. A – I cannot tell you. I cannot predict.? Q -9: Do you think team Anna hazare is naive – politically innocent, or politically motivated? A – We are still in the process of negotiation. It is not a good thing to question their motive. I still hope we have the wisdom to come to the right conclusion. Either our people have not been good at communication. Or there are other interests at work to see that an atmosphere of confrontation is built up and sustained over a very long period of time. Q -10: What do you think of the large middle-class and celebrities that supported your government in 2009, and are now not supporting you on the Lokpal? A – Some events – the telecom scam, the commonwealth games – have caused genuine concerns among large classes of middle-class opinion. That cannot be wished away. So people want that whosoever is guilty must be punished. Before the Commonwealth Games took place, I had announced from the ramparts of the Red Fort on 15th August last year, that anyone who is found guilty of wrongdoing in the Commonwealth Games, we will bring him or her to book. That comment still stands. Q –11 : There is an impression that with your government unable to bring regulatory measures to prevent corruption, you have conceded space to civil society – who are now forcing you to do it? A – I have been working 24 hours a day. I spend 18 hours a day on work – without any holidays. Then there are so many extraneous issues – that affects the ability of the government to attend to essential things of the type that we want to do. It will be wrong to say that I am not affected by such things – it does affect me. Sections of the media have not been responsible while covering recent events. Q-12:– The judiciary has also made some strong statements? I have talked to the judges – and they said these had to do with questions and answers in the process of hearing the cases – in order to clarify their point. They say the way the press reports – it creates a real problem. I think everybody should exercise restraint. When I talk to the judges, they say these are not our intentions, orders or instructions. Press reportage causes sensationalism. Q -13: There was a hope that UPA-2 would push faster on reforms. That record two years down the road has been a disappointment. What is the agenda for the next 8-9 months. A-I think the first thing is to sustain the momentum of growth that we have built. Second, we must ensure that infrastructure does well, is well-managed, its reform is a priority concern. It is in this context that the procurement system in the public sector must be made more transparent – we are all working towards a law which will lay more emphasis on transparency. There are new issues that have arisen, with regard to the management of scarce natural resources – particularly the land question. The land acquisition will require modification. There are several drafts within our government – but it is my hope that we will have a workable draft of the Food Security Bill – and finally – with regard to education and rural health – we have a large agenda. I would like to start a system of vocational education, skill formation, there is a report from Dr Ramadorai – to help me in putting together a design of the sort of systems and working procedures we need. We also need a group in the Planning Commission working on how we can expand and ultimately generalize the healthcare insurance system. Plus looking at citizen’s charters, and create an environment in which leakages in the disbursement of subsidies can be got rid of. I have been told that the system that Nandan Nilekani is at work on – if that system works, we will have instruments to deal with wrong use of subsidies. I think that will be a massive effort. There are other issues also – the consensus that emerged until a few months ago on the Good and Services Tax – the BJP is clearly playing politics, they do not want the government to pass this landmark legislation. We had helped the BJP pass the first insurance bill. All we want now is to increase the share of FDI to 49 percent. The bill is in Parliament. I hope we can still persuade the opposition and other parties to pass the bill. Insurance industry needs that capital. Domestic industrialists don’t have that large capital base. They need that support. There is also the question of supply-chains and distribution of food supply. This is where the question of FDI in retail comes in. There is a big debate about it in government and Parliament. There is fear of small traders, but without breaking such institutional barriers, there is fear of food inflation. I am hoping we can make a beginning in these areas. These are some of the ideas that are uppermost in my mind. Q –14:- There are occasional voices in your party that Rahul Gandhi should take over? What is your opinion? A-I am sure that the Congress Party and the Congress President have entrusted me with this job to do. I have not got any contrary view from the Congress High Command. In fact, the Congress High Command has been most supportive, particularly Mrs Gandhi. Therefore, if you ask me, the general perception – that younger people should take over – I think it is the right sentiment. I sincerely hope that whenever the Congress Party makes up its mind, I have no objection to step down. But so long as I am there, I have a job to do. Q-15: There is a feeling of a drift in the government – the coalition itself is cracking up. There is a question about the longevity of your government. A-There are some of tension. But I am confident that no one wants an election at this time. Therefore, the self-preservation instinct will work to our advantage. We can manage these tensions of the coalition. Q-16:-Do you think you should have dealt with your coalition partners more firmly in your earlier term? A-I really don’t know which is the golden mean. I don’t know if some of these things could have been avoided. Because some of these things which have happened, they have happened without our getting the full picture. Take the case of 2G auction. I had myself written to Raja, that we should consider auction. He wrote back saying this matter was considered by TRAI. TRAI came to the conclusion – which was endorsed by Telecom Commission – this is on record and it is a public property – you also have access to it. He said to me – TRAI is against auction. TRAI is also against other verification which would help the competition between the new and the old. Quite frankly, I felt TRAI exists to advise the government, it is an expert body. And therefore, I left it at that. On the same matter, three letters that he wrote to me, he assured me that utmost transparency, fairness and objectivity will be observed in anything that he has done or will do. When a cabinet colleague makes that sort of an assurance, I cannot sit in judgement. After that someone approached the CVC. The CVC then passed it on to the CBI. The CBI began investigating. They raided the offices of the ministry. Q-17:One of the biggest assets you had was your integrity and honesty. But in the second term, while your personal integrity remains above board, there is an impression that you allowed these things to happen. A-If a cabinet colleague tells me, that in all matters of his ministry, he will scrupulously work by the norms of ethics, fairness and transparency. How can I conduct a post-mortem? I am not an expert in telecom matters. As Prime Minister, it is not that I am very knowledgeable about these matters. Or that I can spend so much of my time, to look after each and every ministry. Ministers administer their departments, and if they don’t apply any policy change, they are free to implement the policy to the best of their ability. One observation that my private secretary recorded, that the Prime Minister says there must be transparency – the minister should have said it was his responsibility – rather than saying that the Prime Minister has also endorsed it. Q-18:-The issue was on the boil on the front pages of newspapers every day. There were questions being asked. A-If I go by the newspapers, there were people writing to me on both sides. If I go by the newspapers everyday, I would have to refer everything to the CBI, and the CBI would sit in judgement. And if we continued in this vein, our public sector would not be able to perform. It would greatly weaken the (entrepreneurial) forces that we have unleashed, and willy-nilly install a police raj. Q-19:How do you propose to recover the lost ground on this? A-My conscience is quite clear…. There is a cabinet decision of 2003. Q-20:What about the CAG draft report on KG Gas? A-I have not read the full report. This is a special report which the ministry themselves had asked for. 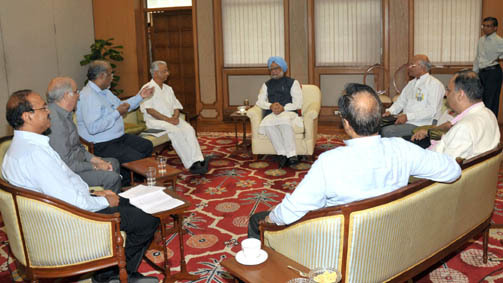 It is never been in the past that the CAG has held a press conference – as the present CAG has done. Never in the past has the CAG decided to comment on a policy issue. It should limit the office to the role defined in the constitution. Q-21: What about the bugging issue? A-There was a complaint that the office was bugged. I asked the IB to do a thorough check. The IB reported back to me that there was nothing of the sort. Q-22:Did it go through the Home Minister? Did he know? A-No. This was on a need-to-know principle. Q-23:There is a perception that Sonia Gandhi is deciding everything and you are helpless. A-Whatever this government has done, I will accept full responsibility. I never felt that she was an obstacle in the performance of the government. My relations with her have never been better. I meet her every week. Q-24:What about the diarchy – she heads the party and you the government – is it not working anymore? A-She has done a superb job of being the President of the party for more than 15 years. Q-25:There was a question of rotational chief minister in Jammu and Kashmir? A-There was a decision of the Congress high command that they would have a full-term as Chief Minister. We have not done anything to reverse that decision. Q-26: What about the current situation in the state? A-We have to be on our guard. We hope Pakistan will leave Kashmir alone, because they have their own share of internal problems. Tourists are returning. We have to keep our fingers crossed. Q-27:What about the current situation with regard to Pakistan? Will you undertake a visit to Pakistan? A-We are not a big player in Pakistan. But whatever our role, engagement is a commitment to our shared geography. They have not done enough on terror. I still feel they need to do more. We need to keep engaging them. Q-28: Is there any possibility that Indian companies will be able to access natural resources in Afghanistan? A- Transit through Pakistan – Pakistan is not ready. Afghan trucks can come upto Wagah. Afghanistan is quite keen. But we also have to reckon with Pakistan’s capacity to protect our enterprises. Situation on the ground is not that good. Q-29: What are your views on theAmrrican pullout form Afghanistan scheduled by2014? A-It does hurt us. It could hurt us. No one knows what is going to happen in Afghanistan. Yesterday, I was talking to the New Zealand Prime Minister, the war in Afghanistan does not enjoy large-scale public support. That’s the reality. If we hold elections every four years, politicians have to be re-elected before they can become statesmen. Q- 30: In Afghanistan there is also the question of good and bad Taliban? A-I told the Afghan Parliament that the reconciliation should be Afghan-led. I think Karzai and other politicians can work on that. You cannot carry the good-bad Taliban distinction much too far. but the Haqqani group –they are a more determined group – perhaps not in league with the Pakistani establishment – I don’t know – but we are worried about them. Q-31: What about our defence preparedness in the light of Chinese capabilities? A-We have started the process. We are looking at the modernization of our armed forces, including the navy and the air force. For the first time in many many years, we have added two divisions to our army. So within the limits of our resources, – we are doing – much advanced air fields in the border areas. We are trying to strengthen the border roads. Also to see, that states on our border – our villagers have access to electricity using solar power. The effort is on. Q-32: The defence expenditure as a part of GDP has been falling from year to year. A-That is true. But quite frankly we have not restricted defence spending – no conscious decision has been taken to any fixed percentage. We are as a nation, prepared to live with a defence expenditure equal to three percent of our GDP. IF the armed forces have a plan to raise their expenditure to that ceiling, the system will be able to tolerate it. Q-33: It will take 10 to 15 years for all of this to materialize? A.The Chinese are far ahead of us. They are building a blue-water navy also. Aircraft carriers – they are acquiring. A-We are tackling that problem at two ends. We are strengthening the development work in the 60 districts. This year we have put at the disposal of the Deputy Commissioner, SP and the District Forest Officer, large sums of money for each of those districts. Money is not a problem. But the main problem is infrastructure. We need to protect the building of roads. There is a proposal to raise a reserved battalion to protect the building of development works in the Naxal-affected areas. If that goes through, I think we will provide greater security to contractors willing to build roads and other infrastructure in those areas. It is a vicious circle. We must strengthen the police and other intelligence. One emphasis is on intelligence so that they match them in actual combat. The other is on development. Development is the master remedy to win over people. If my children are in school, better health facilities are available, if forest rights of tribals are respected, —- implemented, it should win over people. In the short run, government’s writ must run. Q-35:Your environment minister is on record, saying he has had to reverse many of his positions under pressure from you? A-I think he is right. Q-36: Are you pressurizing him? A-As Gandhiji said, poverty is the biggest polluter. We need to have a balance. Q-37: Mamata Bannerjee in West Bengal and Sharad Pawar in Maharashtra are opposing the gas price hike. How is this effecting the functioning of the coalition? A- I have nothing much to say about these tensions. Q-38: At Air India, the situation seems to be getting from bad to worse. What is the government doing about it? A- I was discussing this with the Principal Secretary only yesterday. I think I have to tell the Pranab Mukherjee led group to expedite considerations on the proposals that are in the offing. So I am aware of it. There was some difficulty in paying salaries last month. Q-39: In terms of perception, Your second term seems to be somewhat of a disaster. Your credibility has been damaged and you have become a lame duck Prime Minister. PM: Much of these happened in the first term. …(interjection) This is the result of the clever propaganda of the opposition. Because whatever we are discussing today it was already in the public domain when elections were fought. This is nothing which happened now, I think. PM: The Common Wealth games bulk expenditure was incurred before 2009 elections and what could we do. As far as the Common wealth games were concerned, there was a group of ministers under Arjun Singhji, there was a group under Jaipal Reddyji. As far as Kalmadi’s presence is concerned for you have also written Mr. Ninan that our friend Mani Shankar Aiyar wrote to me,but he wrote to me on purely ideological grounds – he was opposed to hosting cwg. (Interjection- sir but budget) That is the job of his Ministry – to tell us about the budget.It was the responsibility of the Sports Ministry- they had to c ome to the Cabinet. There is no mechanism in PM’s office to look at all the minute details. Mani Shankar Aiyar wrote many letters to me. Bulk of the letters were all on ideological aspects of spending so much money on the Common Wealth Games – we should be doing — nothing he brought me anything that was wrong. At one stage, I did get worried – I did get reports but at that one stage we put some officials under Jarnail Singh to keep a watch. Question is how effective was that supervisionJarnail Singh. But Kalmadi was there because he was the President of the Indian Olympic association. The agreement to have CWG was signed in the year 2003 when the previous government was in power. PM: Well I have reason to believe that ultimately truth will prevail. PM: I agree. Quite frankly – I did not expect the effect of shock injection of liquidity into the system by the United States. I could not anticipate that the Middle East would once again go into turmoil. Commodity prices, food prices, energy prices are variables over which we have no control. And if you exclude these I think the rest of the inflation is still marginally above what would be considered as inflationary. Now we have the no magic wand to bring down international commodity prices – particularly of food grains – we cannot force our farmers to part with their food grains for procurement at unreasonable prices. That will be suicidal to our farmers. One thing what this Government has done is, it has increased the procurement prices in a manner like no one has increased in the history of the country. (Interjection : That is the root of the problem.) No it may be the root of the problem but that is also our safety net. That agriculture is in good shape. That we have all time high stocks of foodgrains. We have at long last been able to reach out to large numbers of our people. Q-43:The Food security law wants 80 million tones procured, that is impossible. A. Maximum that has been procured is 57 million, the average procurement for the last couple of years is 55 million tones. We have to work out a system within this. Q.44: How would you control Inflation? A. Inflation is a global problem. Chinese inflation rate has also gone up sharply. We have so much liquidity in the world, and in an integrated world economy we cannot wish away some problems. If oil prices soften and if commodity prices remain where they are, then I asked Rangarajan the other day, and he said that by the end of March, we should have an inflation rate of 6.5 percent. Q.45: Have you seen the Chinese figure on hidden debt – all of it has suddenly emerged. A. The Chinese system is opaque. They have a visible very small fiscal deficit. But there are reports that the banking system is financing their infrastructure out of their non-performing assets which is leading to these debts. Preliminary transcript of the Q & A session between the PM and Newspaper Editors. The Hon’ble incharge of the department,need your help. Mr. Dipak Kumar Adhikari (North 24 pgs committee member CPIM) so any body/ you do not take any action? But it is state before you the prime accused “Dipak Kumar Adhikari” and others accused were shown in the charge seeted. Addl. Superintendent of Police. Barasat. North 24 Parganas. Barasat. GROUND FLOOR & 2ND FLOOR RENT AS A BISSNESS AT LAST 7 YEARS. WIFE AFTER LONG 7 YEARS, IN THIS CIRCUMTENSES HIS WIFE LEAVE ADHIKARI HOUSE AND SHE (MRS. MANY MANY WRONG & FALSE STORY LIKE THIS. toothless. Mr. Dipak Kumar Adhikari Kill Mr Samanta and his Son & his whole family any time any day). Mr. Samanta is a HONEST AND HELPFULL PERSON. So Earnestly request PLEASE you would care to HIM. Mr DIPAK KUMAR ADHIKARI HIS DETAILS- Tegharia(Dhali Para), NandanKanan. P.S. : Baguiati.P.O. : Hatiara. No action taken still now. The Hon’ble incharge of the department. I need your help. Please help me. Police / Political Leaders / Judicial Magistrate to take bribe I have lots of evidence, I think not taken any action because many Police Officer including IPS Officer, and Many Government employee are lose there service and go to jail. So West Bengal Government not take any action. Am I right? Mr. Shankar Kumar Samanta (Kolkata jella committee member CPIM) and his son Mr. Sandip Samanta (DYFI Member) so any body/ you do not take any action? A case was filed by me In the court of LD. C.J.M. At Barasat, Date: 13.04.2010 U/S- 156(3) of criminal Procedure code charge U/S: 323, 379, 406, 479, 498, 500, 506 READ WITH 34/120B OF INDIAN PENAL CODE. The case is starting At Baguiati Police Station Case No-168 Date: 24.04.2010. The I.O. At Baguiati Police Station of the case has already been charge sheeted according the names. The I.O. At Baguiati Police Station accused all miscreants in the charge sheeted but neither took any measures to round up them rather they paved enough (more then 2.5 months) time which make them the way to take bail. Anyhow Application under Section 438 CrPC Among the accused person Shankar Kumar Samanta (S.B.I. Officer) and his son Sandip Samanta has been granted bail by the Ho’ble Calcutta High Court. Please note that the prime accused “Beauty Adhikari” others are large and they are available in there house, each and every time. I therefore prey before your kind honored to Make arrangements to arrest the prime accused “Beauty Adhikari” and others as they were shown in the charge sheeted “As prime accused ABSCONDING” Prime accused “Beauty Adhikari” and others are large and they are showing in there house, each and every time. I informed this matter to Sri Rahul Srivastava, IPS Officer. The Superintendent of Police. Barasat. And S.M.H. Meerza, Addl. Superintendent of Police. Barasat. North 24 Parganas. Barasat. 100% now I believe that if you have money then you can get anything, every thing is possible by you. If you are a poor then you can’t get anything, every thing is far and beyond possible to you, also you get poor judgment and poor comportment in all aspects of life, in our country INDIA. For example 1. I. I went to Police Station more than 100 times, made 5times entries (complaints) into G.D. but Not even a microscopic actions took place against the alleged bodies. On the contrary Sandip Samanta, S/O. Shankar Kumar Samanta (S.B.I. OFFICER Ph. No. 9830366434, Branch: 24B, Nimtala Ghat Street, Jorabagan, Kolkata- 700006, West Bengal, India‎, Bank Ph. No. 033 25308337) he has much more and enough money so they purchase all police personnel’s and some political leaders, some Dada. Etc. Only I used to get many letters and many phone calls which all seem to me needs to be thrown in the trash, as it all are valueless, toothless and only simply a solace to the poor. What an undone boy I am! Woe is to me! My wife and her family, Shankar Kumar Samanta and his family harassed me and my family, they are torcher me physically and mentally (Mr. Shankar Kumar Samanta Kill me and my family any time any day). We got married 05/03/2002, and have a daughter who took birth on 09/07/2005. My wife and her family (Including Shankar Kumar Samanta (S.B.I. Officer) and his son Sandip Samanta )lodged a case 498A/34 IPC, FIR NO.276, date 31/08/2009, P.S. : BAGUIATI, against me and some of my family members it’s a fabricated, baseless, legless, toothless and doesn’t have any commensurate to the fact. My wife is engaged and having an illicit affair with a boy (Sandip Samanta, S/O. Shankar Kumar Samanta S.B.I. Officer Ph. No. 9830366434, Branch: 24B, Nimtala Ghat Street, Jorabagan, Kolkata- 700006, West Bengal, India‎, Bank Ph. No. 033 25308337) just opposite to my house, all the matters are known to every person in my village, and also they have certified me written about my fresh character and nature. When my wife left form my house with Sandip Samanta taking many vory gold and cash 1.20 lack Indian rupees. What a demon she is! She didn’t take our only daughter (only five years old) who is now in my house having severe asthma supported by inhaler. My wife filed the 498A case dated 31/08/2009 and I was arrested on 06/09/2009, how much money Taken Baguiati police form my father and others for 498A/34 I.P.C., fabricated Charge Sheeted, I don’t know, because then I’m in Jail. The Ld. court granted me on bail on 19/09/2009. Barasat court. I have lots of irrefutable evidences, (20 pcs. Adult S.M.S., Mr. Samanta’s Mobile Phone, Mr. Samanta’s SIM Card, Adult picture with the boy, G.D.E, MANY MANY OTHER PAPERS RELATED TO MY CASE and TWO c.d. ), with me where it is cleanly reveals which translates my wife and the boy that they are in illicit relations. Believe me I and my family would love very much (which is very rare seen in our society) to my wife and never any kind of love lost didn’t happen. They (My wife family) are very very poor and live in a bosti Address: 70/H/8 Manicktolla Main Road, Kolkata – 700054, Beside 5 Star Club, my mother saw 1st time and she arranged my marriage. Before marriage my family did not see the pedigree of my wife’s family, now we understood also realized that they hailed from a worst status. My wife, her family and (Sandip Samanta, S/O. Shankar Kumar Samanta S.B.I. Officer) all they are misusing this law. Now my wife’s family knows all the affair-related matter. My wife left our only solitary daughter to me who is 3 years old (Now 5 years) having severe “Asthma Disease, depends on INHALER, here political Hide and seek, ducks and drakes and lots of unfair means are going on and the father of the parents (THE FATHER OF THE BOY WHO HAS ILLICIT RELATIONS WITH MY WIFE) are rich, so they are spending money to everywhere with a view to be escaped. Now I decided that in no way I can’t accept that demon wife. I hired a lawyer his name Mr. Kamelash Nandi. I don’t know what will be happened next? It’s an utterly a huge and a palpable offence subsequent to which the boy deserves severe and examplanary punishment so that no one can dare to abuse this law. My mother is a sugar present shies sugar is now 400. If possible please help me. Please investigate the matter thread barely and save me and my family. I leave here one question to every one that in this die-straits situation whom do I take care to myself (TRAGEDY), my daughter, or my mother (severe Diabetic). My wife filed another case me U/s. 125 Cr. P. C. Case NO.167/2009, J.M. 1st Court Sealdah, 1st Floor. Room No: 103, Kolkata-700014. South 24 Parganas. Date 16/12/2009. Mr. Shankar Kumar Samanta purchase Sealdah Court 1st J.M. Mrs. Nita Sarkar. I get only date and date and date (4 to 5 times in a month)…I am millions miles away from the genuine and authentic investigation and inquiry. No inquiry, investigation were executed against the F.I.R lodged by my wife. It is very painful, lamentable as well as heart rendering, breath taking affair to me and my family. My heart bursts into guffaw when I see the nature of the inquiry and investigation. One thing is as clear as crystal to me that the law and the task of the law enforcing agencies vary from man to man. A new proverb is going to take birth very soon that “Justice for the rich and Injustice is for the poor” A rich reserves the right to indulge in any kind of heinous business but the poor is restricted to involve in any type of excellent deeds” To see all these my heart is about to come in the mouth and the ground under my feet gets shook. In a word all types of Law are for the poorest and the richest will enjoy the richest judgments from all quarters. After coming form the DumDum Central Jail, I mat with the BAGUIATI POLICE O.C. Mr. Goutam Mitra, and asked him politely: “ SIR I FAILED TO UNDERSTAND THAT I MADE SO MANY ENTIRIES INTO YOUR G.D.E. BUT YET NO ACTION SO FAR HAS NOT BEEN TAKEN FORM YOURSELF” then BAGUIATI POLICE O.C. Mr. Goutam Mitra, went through all my papers (20 pcs. Adult S.M.S., Mr. Samanta’s Mobile Phone, Mr. Samanta’s SIM Card, Adult picture with the boy, G.D.E, MANY MANY OTHER PAPERS RELATED TO MY CASE and TWO c.d.). After seeing all my papers he told me that I cannot take any action until and unless you lodge a case against all of them. Then I Prayed to the Ld. C.J.M at Barasat court to lodge the case, against the alleged person. (The payer to the Ld. C.J.M. is enclosed which is self-explanatory) after filing the case (The case is starting At Baguiati Police Station Case No-168 Date: 24.04.2010. CHARGE 323, 379, 406, 497, 498, 500, 504, 506 READ WITH 34/120B OF INDIAN PENAL CODE) the BAGUIATI POLICE O.C. Mr. Goutam Mitra, and I.O. Mr. Prasenta Kumar Das, Mr. Ajay Kumar Ghosh, in stead of taking not any take investigation/ not take any action/ not take any type of query to recover my Cash and Gold form the house of Shankar Kumar Samanta, The BAGUIATI POLICE O.C. Mr. Goutam Mitra, and I.O. Mr. Prasenta Kumar Das, Mr. Ajay Kumar Ghosh, took my case as a Golden Goose, and how much money BAGUIATI POLICE O.C. Mr. Goutam Mitra, and I.O. Mr. Prasenta Kumar Das, Mr. Ajay Kumar Ghosh, has taken is well known to them. Neither he took any take investigation/ not take any action/not take any type of query nor he did roundup them against my case. When I saw that already near by 90-100 days went by “ I went to the BAGUIATI P.S. to know the status of the case then BAGUIATI POLICE I.O. Mr. Prasenta Kumar Das, Mr. Ajay Kumar Ghosh, became outraged me and my mother that if you ask about Shankar Kumar Samanta and his family I will sentence you and your family in the Jail, all their languages is so much filthy dirty which I cannot express front of you. As I’m 100 percent innocent so I screw up my courage to place my grievances to every body in order to get redress. So I want to let my matter informed all the Indian and others. I wrote my matter to our local P.S., Local Councilor, all M.P., M.L.A., Minister in W.B. and Other States, C.M. in W.B., CBI Department, CID Department, S.P. and Dy.S.P.(N.) 24 Parganas, DGP Bhupindar Singh, All the I.P.S. AND I.A.S. OFFICERS, All DGPs/IGPs . Election Commission of India, All Indian Union Minister, UPA Chairperson. Sonia Gandhi, Governor in W.B, and President in India 25th times write ((My Request/Grievance Registration Number is: PRSEC/E/2009/12581, PRSEC/E/2010/01100, PRSEC/E/2010/03797, PRSEC/E/2010/08720, PRSEC/E/2010/06692, PRSEC/E/2010/12464, PRSEC/E/2010/17088, PRSEC/E/2011/00423, PRSEC/E/2011/02405, PRSEC/E/2011/03705, PRSEC/E/2011/04474, PRSEC/E/2011/05314, PRSEC/E/2011/08159, PRSEC/E/2011/09368, PRSEC/E/2011/09369, PRSEC/E/2011/09750, ……AND OTHER NUMBER I MISPLACE). P.M. in India, National/International Human rights department, AAP KI KACHEHRI – KIRAN KE SAATH, Kolkata Police, and all police officers in W.B. informed Kolkata Commissioner of Police, Manager S.B.I.-Branch: 24B, Nimtala Ghat Street, Jorabagan, Kolkata- 700006, West Bengal, India‎, Bank Ph. No. 033 25308337. My nation, all of the news channels, and all press, The Central Vigilance Commission, Talking with some NGO’s: 1. Universal Right and Duty for Human to Abide URDHA, 2. Human Right Commission’s Mr. Ujjal Paul and Mr. Shibaji Dasgupta. 3. Bhatat Bachao Sangathan BBS. 4. Forum for Social Justice and Development FSJD. 5. Ajjtak News Channel’s Miss Menogya. and many more, (anybody can’t help me/ fight for truth /don’t take investigation/do not take any action/don’t take any type of query/ Still Now, many department told does not comes under the purview of our department. Then my question is where I go now? I see they all are in sound asleep. The reason is best known to them. I think not taken any action because many Police Officer including IPS Officer, and many Government employee are lose there service and go to jail. So West Bengal Government not take any action. Am I right? I hope you would care to me, your prompt action shall be highly appreciated and deserves to be lauded. Tegharia(Dhali Para),NandanKanan. P.S. : Baguiati. P.O. : Hatiara. Dist. : North24Parganas.